Curator Caroline de Guitaut makes final adjustments to the special exhibition 'A Royal Wedding: HRH Princess Eugenie and Mr Jack Brooksbank' in the Grand Reception Room at Windsor Castle, 1 March - 22 April 2019. Photo: Royal Collection Trust / © All Rights Reserved. LONDON.- From Friday, 1 March, a visit to Windsor Castle will include the special exhibition A Royal Wedding: HRH Princess Eugenie and Mr Jack Brooksbank. 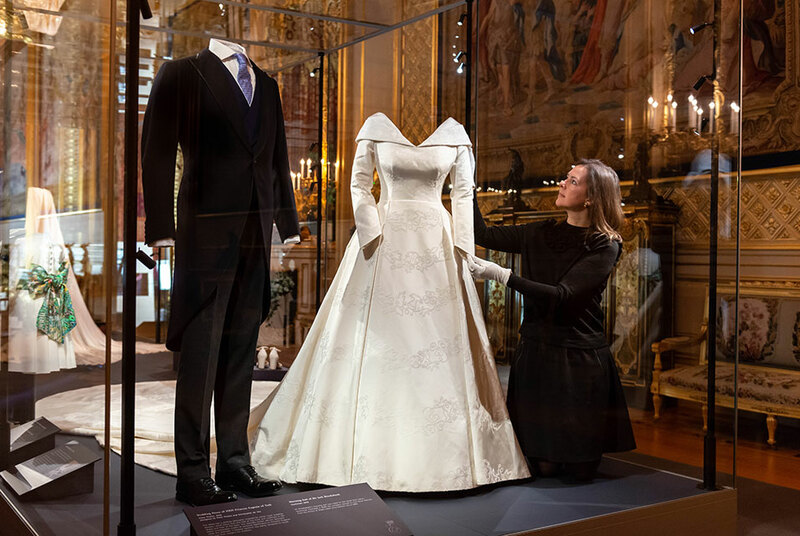 The display includes Her Royal Highnesss wedding dress, tiara and evening gown, Mr Jack Brooksbanks morning suit, and the maid-of-honour outfit of HRH Princess Beatrice of York. Princess Eugenies wedding dress was designed by Peter Pilotto and Christopher De Vos, who in 2007 founded the British-based label Peter Pilotto, known for its innovative textile design and sophisticated cut. Her Royal Highness, Mr Pilotto and Mr De Vos worked closely together on the design of the dress, which has a neckline that folds around the shoulders to a low back, which drapes into a flowing full-length train. The fabric of the dress, also designed by Mr Pilotto and Mr De Vos, includes a number of symbols that are meaningful to Princess Eugenie, such as the White Rose of York, interwoven with ivy representing the couples marriage and their future together. The symbols were reinterpreted in a garland motif woven into a bespoke jacquard fabric. Her Royal Highness wore the Greville Emerald Kokoshnik Tiara, which was lent to her by Her Majesty The Queen. On public display for the first time, the tiara is made of brilliant and rose-cut diamonds pavé set in platinum, with six emeralds on either side. It was made for Mrs Greville in 1919 by the Parisian jewellery house Boucheron in the fashionable kokoshnik style popularised in the Russian Imperial Court. Mrs Greville bequeathed the tiara to Queen Elizabeth, consort of King George VI, in 1942. Princess Eugenies diamond and emerald drop earrings, which were a wedding gift from the groom, are also on display. A replica of Her Royal Highnesss bridal bouquet, made from artificial flowers, has been created for the exhibition. Designed by Rob Van Helden Floral Design, the bouquet consisted of lily of the valley, stephanotis pips, baby-blue thistles, white spray roses, trailing ivy and sprigs of myrtle from Osborne House. The myrtle bush at Osborne grew from a piece in the posy given to Queen Victoria by Prince Alberts grandmother the year that the royal couple bought the house on the Isle of Wight as a family retreat. A sprig from the shrub was carried in the bridal bouquet of Queen Victorias eldest daughter, Princess Victoria, at her wedding in 1858, and the tradition has been continued by royal brides ever since. Mr Jack Brooksbanks wedding outfit was a black and grey morning suit with a vivid blue waistcoat, made by tailors at Huntsman of Savile Row, London. Princess Eugenies evening gown was created by the American designer Zac Posen. Mr Posen took inspiration from the beauty of Windsor Castle and the surrounding countryside, and chose a fabric in the blush colour of an English rose. The gown is made of British silk chiffon and incorporates a cape, subtly embroidered with the White Rose of York, gathered at the lower back and draping into a softly pleated full-length train. Also on display are two diamond wheat-ear brooches, lent to Her Royal Highness by Her Majesty The Queen and worn by the Princess as hair slides at the evening reception. On public display for the first time, the brooches were originally commissioned by William IV (17651837) for Queen Adelaide (17921849) and were inherited by Her Majesty in 1952. The Queen has worn them as both hair slides and brooches. As maid of honour, Princess Beatrice wore a blue dress with an asymmetrical neckline by the London-based couture house Ralph & Russo, and a blue and purple headpiece by British milliner Sarah Cant. The outfits of the six bridesmaids and two pageboys were by the London-based childrens designer Amaia Kids. The pattern on their sashes was based on a work by the American artist Mark Bradford, which was also reproduced on the Order of Service. The exhibition includes the bridesmaid and pageboy outfits of Miss Theodora Williams and Master Louis de Givenchy.